There is no mystery about what the judges aren’t looking for. They aren’t looking for a self-centered, mean girl who hates people. What they are looking for is a much longer list. 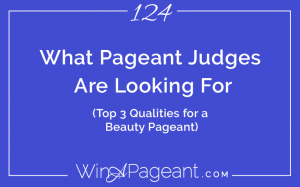 We can’t know the entire list of what the judges want in a titleholder (because frankly, they won’t know until they meet her), but there are three specific characteristics that historically win – even if the judges aren’t necessarily looking’ for them. The good news is: you can communicate all of them if you prepare in a mindful way. The bad news is: so can everyone else. If you apply the 3 characteristics I’m about to teach you to your pageant preparation, you’ll already be light-years ahead of the competition. Relatable is the ‘just like me’ quality. It means that you are a person that has similar challenges, successes, experiences, stories, and qualities that other people have. This is a quality that people trust. They can see all sides of your humanity. Marketable is the business quality. It means that linking their pageant to you will attract more of their customers. It’s like Nike hiring a professional athlete vs. a high school piano player. Pageants want to align themselves with women that look, behave, speak, and interact in positive ways with their same target market. This is why platforms, community service, and online presence are so vital to many pageants. Engaging is the social quality. It means that you grab and hold attention. The best way to hold attention is through story-telling because there is a natural flow of feelings like taking a ride or watching a movie. If your voice is soft, your energy is low, or your eyes are wondering you won’t be seen as engaging. Pay attention to your behavior when you are with friends, feeling great, and doing something you love – that is your true expression of engagement, let the judges see it! For some women, these three qualities come naturally. For others, they are learned. But, even if you have the qualities, the work is in preparing yourself to successfully communicate these to your judges throughout your performance. That’s what we do in the Pageant Interview Game Plan. This time of year, most women have lost their pageants. It’s unfortunate, but it’s true. When there are 20 women competing and only one wins, most are losing. It’s terribly painful. But, of course there are lessons even in the pain of pageantry. I wrote an episode about losing gracefully when my dad passed away a few years ago. Losing him was a familiar feeling to when I lost pageants (we all lose more than we win). When so much of your mental, emotional, and physical energy is put toward something you view as a goal to achieve left in the hands of 5 strangers, then not achieving it can feel like a massive shock coupled with the stages of grief like anger and depression, even self-loathing and pity. At the very least, even the most emotionally well-adjusted human will feel let down and the sobering reality of depleted adrenal glands makes you want to just eat chocolate cake, lay in bed all day, watch cartoons, and swear you’ll never compete in a pageant – ever – again. Then, in 2 days your adrenals will have replenished. In 4 days, you’ll start looking through all the photos, remembering the fun times you had during pageant week. In a week, you realize everyone in your life has forgotten all about the pageant anyway and have some new distraction to concern themselves with, and then one day, you’ll realize why you did this whole song and dance to begin with. In this episode, I’m going to teach you to brace yourself to quickly recover from a pageant loss….To save you the sad backstage tears, the fake smile at the after party, and the days or weeks of depression that pageantry could force you into – if you don’t follow these steps. Before you begin to prepare for your pageant, write a letter to yourself that you’ll open after the pageant, only if you don’t win. Tell yourself all the things you’d most like to hear. Make a list of the reasons your glad you didn’t win. Write a list of things you get to do now that you don’t have to hold a title for a year. Tell yourself to call a friend or leave your favorite recipe in there. This is your safety net. After you write it, put it in a sealed envelope and hide it in your sock drawer. If you need it when you come home, you’ll remember it’s there. Make your mission bigger than just winning a pageant. If you become depressed or give up on everything just because you didn’t win, then the judges were wise to not choose you. The woman that is selected is the one that cares in a way beyond herself. She has compassion for the next generation, a mission to lead, and a passion to pursue. You need this level of vision. I recommend a 5-year plan that starts the moment you begin preparing for your pageant. One year will be the year you are the titleholder, but the mission comes before and after that year. Your vision has to be something that the crown will enhance, but not something that relies on the crown. Often, after a pageant loss, we feel unworthy or unloved because we weren’t chosen’ by the strangers. This is the perfect time to remind yourself you are worthy, loved and chosen. Think about how you receive love. Is it in a thoughtful gift, a green smoothie, going for a nature walk, reading your Bible, spending time with friends, the hands-on adjustments in yoga class, or a relaxing massage. Whatever makes you feel loved, do it – not just after the pageant, but as you prepare. Make it a conscious effort to show yourself some love every single day. After the pageant, there are several things you can do for healing. Reflection is the best way to learn and to grow. Use your pageant as an opportunity to step into a more expansive version of yourself. Get out a journal and ask yourself questions like what do I wish I would’ve done differently? What did I learn from this experience? What would I focus on more if I could go back and do it over? What bullet am I dodging by not winning? What was the best thing that happened that weekend? You don’t have to do anything with the information, but the process of asking, answering and general reflection will bring so much wisdom. We enter heaven’s gates with gratitude. If you want out of hell and into heaven, the key is to give thanks. I recommend writing your thank you notes to all the people that helped you on this journey, but also to a few people that may not expect it – like your back stage volunteers, or the mom of your new pageant sister, or the host hotel. God has a plan for you to prosper. Don’t doubt that. Just because you didn’t win this pageant doesn’t mean He’s left you out to dry – He never will. He feels your hurt and loves you so much that He’s going to provide something even better – maybe another opportunity this year or maybe a pageant win a few years from now, or maybe – like me, He’ll use your loss to fuel you to impact women around the world. Let Him wrap His love all around you. Maybe in your favorite flowers, maybe in a stranger’s compliment, maybe in a sense of peace. I promise, if you start looking for where He’s showing up in your life, you’ll see it. He promises to show up when you go looking for Him, so try it! Go get what God has waiting for you!